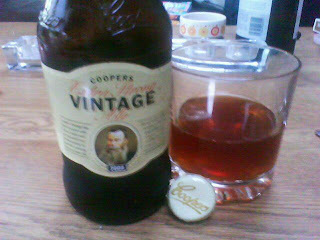 I misread the permitted weight allowance of luggage per person for a flight to Spain, after ironing 20kilos of clothes which only later discovered should be 20lbs I cracked open a bottle of Coopers Vintage Ale 2008. At 7.5% this would enable me to make an executive decision on the wardrobe. It pours like a lemon and honey drink, golden brown with a slightly burnt orange tinge. On the nose it's all summer fruits - strawberries, raspberries with some yeasty, bready notes. The palate was really surprising, theres lots going on in this. Caramel, ripe fruit, kinda toffee apple-ish with a fresh citrus twist. It finishes really smooth and creamy with no bitterness on the finish. The sweetness reflects the alcohol content but it's very well balanced. hAVE JUST BOUGHT MY ANNUAL SUPPLY OF THE VINAGE ALE. EACH YEAR I BUY 6 - ONE FOR NOW AND THE REST TO CELLAR OVER THE NEXT YEAR OR SO. THE 2006 IS WAITING FOR ME AS I SPEAK. A CRACKER OF AN ALE FOR KEEPING AND MATURING.